I love needlework. I love knitting. I love doing creative things with my hands and my brain. A few years ago, I discovered something else to love: paper. Not just the kind with black printing in it that lines my bookshelves, with fancy covers and ideas and lives that take you somewhere else, but fancy paper. Like the stuff that has bright colors and triggers the imagination. It started a few years back with a visit to Binders Art Supplies in Buckhead. We were in the neighborhood running errands and seeing the old Disco Kroger (yes, it's still called that!) and we stopped in Binders. Oh, did my heart stop when I saw all the bits of paper and cool stationery they had for sale. I'm a sucker for writing letters; there's nothing like sitting down at my grandfather's accounting desk, with the tilted top and the old cherry wood and the scarred leather top, and just putting pen to paper and telling someone what's been going on in your life. Or asking about theirs. It slows one's thoughts and organizes them differently, and there's the added bonus of someday receiving a letter in return. Where the writer tells you all about their life and asks you about yours. It's an art that is too often neglected. This visit to Binders then led me to a new-ish store called The Paper Source and I was hooked. Totally, completely, hooked. I took a class on how to make paper flowers. They're a bit tacky, quite fun, and just the thing to dress up a dark corner of my desk. And I get to play with paper and sharp scissors and glue. I kept wondering how I could dream up a project where I could play some more. And then I happened upon it: a photo album! I could make my own photo album! With my own photos! I have an account at one of these on-line places, where you log on and they tell you all about their specials (like, every day of the week specials), but you can also send them some photos you've taken on your electronic camera and they'll process them for you, just like the old days. You can determine the size, what kind of edging, and how many prints of each. You see, we had an old dog. His name was Dave. After I closed my shop, his arthritis began to get very, very noticeable. He was having trouble standing up. He wanted to be with his people, but our walks were getting shorter and shorter. He couldn't sleep in with us on the weekends, and life was just getting pretty tough for him. We often visit some relatives in Springfield, IL, and that year we took Dave with us for a visit. And we happened to stop at a National Recreation Area called Land Between the Lakes in Kentucky and had an amazing experience. And we took pictures. And we visited a Ranger Station that had ambassador animals (those that can't be re-released into the wild) as well as some Red Wolves. These beautiful animals have been hunted almost to extinction, thus throwing the balance of prey-predator way out of whack. This Ranger Station is doing a lot to re-introduce these wolves back to where they belong and we were thrilled to be able to see them. They're quite small; no way they're going after a 2,000 pound beef steer. Or a calf. Mama cow would not be pleased and is way too vigilant for that kind of hanky-panky. So here was the perfect project: photos for a photo album, plus the do-it-yourself photo album, plus tons of pretty paper to cover the photo album itself (instructions are included, thank goodness! ), plus a variety of pens and some incidental paper to tell the story of Dave, and us, and the animals and plants we saw at LBL. And it took a few months to put the photo album together (no cats and glue on the same desk, please), then a few more weekend afternoons to create what I wanted to say on a page and what paper or pen I wanted to use. It was a lot of fun, I already have a new project purchased (a decorated shoe box for the many cat toys. With cat paper), and there will be more in the new year. This is the front cover. I wanted some autumnal color and nature imagery to set the tone. The album is bound with linen tape (comes with the album) and attaching screws (also comes with the album), and this was the part of the assembly process where I followed the instructions exactly. Not that I usually don't . . This is the inside front cover. Also autumnal in coloring, and a very fine silk paper with the lines. The pages of the photo album are black, very thick, and just begging for some decorative writing. So a gold shiny pen was the answer to this portion of the album. This is a picture of one of the ambassador animals. It's an albino stag. Pretty magnificent, eh? He has a huge rack and was just peacefully watching the world go by. The papers were just pages from a book of papers The Paper Source had, and they made a great autumnal background for the pictures. And you can tear them and write captions on them for your photos. This is the Eastern Red Wolf. Though you can't see from the picture, its snout is smaller than that of a coyote, and definitely smaller than that of the larger Grey Wolf. They're very delicate animals. They do not pose a threat and I think that those who decided on the "predator control programs" are in a very dark place being roasted over nasty dark pits. But that's just my opinion. Here's a shot of the lake itself. Yes, the water was really that blue. It's a man-made lake that was created during the Great Depression by the CCC, and the central part is now the National Recreation Area. It has 60 miles of camping, astronomy, and re-created 19th Century farms. It's worth a weekend to visit. It really is. Have a great and restful time these next two weeks, and see you in the New Year! It's a true thing. We go to one of the off-site consumer trade shows for needleworkers: Celebration of Needlework or Stitches (insert region here), or even take a jaunt to our local needlework shop. And what do we do? Why, we BUY stuff, that's what we do. And we bring it home! And we can't wait to begin to work on it, so . . .
We now have an extra pack of needles (cuz we don't know what needles are in our various projects) and extra floss (cuz, you just never know), and then we set up our project on our frame, or swatch it . . . and before you know it, you've got a new project started! Then you turn to your stash and you say, "Sorry, my dears, but you see, I just bought this new project, and I really just want to start working on it, and I need to start now, and I'll get back to you soon, I promise." A year ago, I cleaned out my stash *gasp* with some little dog blankets. Not really big ones, but there is a link I found that lists places that accept knitted dog or cat items, and I found AHIMSA House, which rescues animals that are in abusive situations so that the survivor can get free without worrying about her animal companions. So as I knit, I wove the thought of comfort and love and calm into these little blankets, and I used up a whole bunch of acrylic and washable wool yarn in a simple K10P10 basketweave pattern, and voila! There was room in my stash. It was smaller. Oh, and the lovely volunteers who took my blankets thought they were the prettiest things and they had small dogs that were going to go into foster care soon (which means someone was getting away to safety, thank the Goddess), and they would be put to immediate use. And because they were machine washable and I knitted with two strands on smaller needles, there was less chance that they would be pulled or damaged by little animal nails. Then I found a catbed pattern (also useful for small dogs) that uses FELTED yarns, and I looked at all my scraps of alpaca and Brown Sheep and other wools (not the English ones, though, that's slightly different!) and thought, "Aha! I can make this felted cat/dog bed and there will be more room in my stash!" Which was perfect, because I do have several projects that I need to get finished and this way, I could get those completion endorphins that only come with finishing a project. And move onto the neglected projects. So what did I do? I bought some bright pink Lamb's Pride Worsted to add to the cat bed for a touch of whimsy, and then I got stuck. Do I test felt everything? Do I go ahead and knit it? Could I add sock yarn and use up some of it, knowing that it doesn't felt? And the thought that has paralyzed me: what if I test knit and test felt and I run out of yarn??? I suppose the first step is to admit we have a problem, and then the second is to go ahead and do something about it. But you see . . .
One niece is about to have her second baby, and the first one needs her own little blanket, so I HAD to buy some cool crochet yarn and crochet a simple ripple afghan (from a long discontinued book that I've used time and again), and of course I had to buy yarn for the new little girl who's going to be born in cold climates in early September, and everything for this little family had to receive first preference so that new baby gets her warm sweaters when she's still a baby . . .
And really, the stripe pattern doesn't matter: she's two, she loves pink, and with luck she will drag it around the house while she gets used to a new presence in her life. And of course, with patterns in hand, including one I used for her older sister, I run off to a local knit shop and find new yarns to knit these two new sweaters. Which means . . . the projects that were almost seeing the "done" sign have been relegated to the bottom of the stash. Not to mention the stash knitting I need to do, which still involves deciding whether to swatch (do I have to??) or just go ahead and knit (what if something screws up??). And then there are the Yuletide sweaters for other great nephews and nieces for whom (which?) I've already bought the yarn . . . Which brings me to the current project: knitted little girl baby sweater. I have forgotten how quickly baby sweaters take when compared to sweaters for older children! Sweater #1, pink, is now at the sleeve #1 stage (and #1 is almost finished), so this afternoon will be spent listening to the baseball game and knitting sleeves. Then assembling, and with luck I'll be able to take to Thursday's AKG meeting. And then I start on Sweater #2! It's a new project, right? I can feel the New Project Madness taking over, before I've even begun it. I really want to start Sweater #2 NOW because I want to see how the sweater pattern goes . . . It is truly, sheer madness. 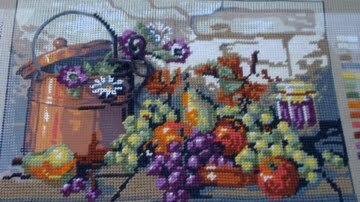 Counted needlepoint of a tea house, from way back when. I brought it for a needlepoint demonstration and felt sooo incredibly guilty that I haven't worked on it in soooo long. Yes, this one is almost done. Thank goodness there's only a little bit to go (haven't even updated pictures for a while!) and I have enough Persian yarn to complete it. So, off to catch the Braves game and knit a sleeve. Or two. Just not three!